Green Guards, a group of Volunteers from surrounding societies of DDA Herbal Park, site 1, in Sector 6 took initiative to assist A senior citizen Mr. Jai singh Dahia, one man institution devoted to protect promote the environment through caring green cover of the same. For the last and half years Dahia ji has shouldered single handedly the responsibility and could be called a Moving Tree in whole park to take care of all other plants and trees . This park is an only one herbal park in whole of Dwarka parks where nearly 120 varieties have medicinal values and a few trees are arranged voluntarily from countries like Australia and South africa. Almost 175 sensitive residents came forward on Dahiajis’ call to stand behind him to augment the beauty of this park. Sometimes ago some people organized a small event wherein This Towering Personality was bestowed with honour of Park -Purush without giving any hint to him about such event. Formation of Green Guards is one step ahead to give formally an impetus to protect and protect the environment of not only this park but all the parks of Dwarka. The people from other parks also invited to give glimpse of the initiative this Organisation took to get it replicated in their parks . 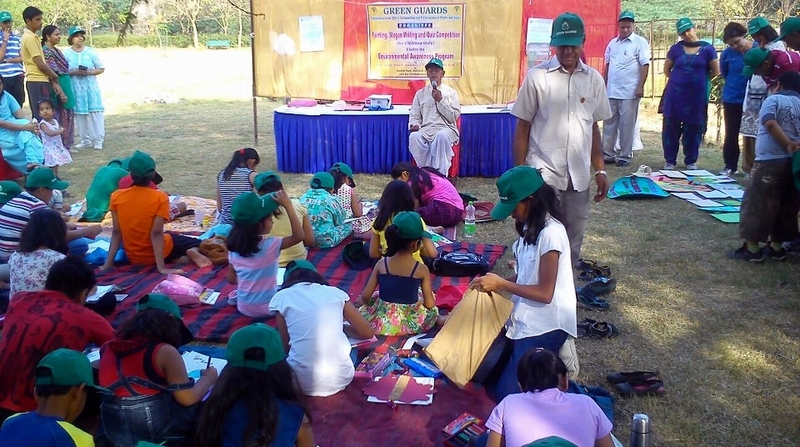 A Painting , Quiz and slogan writing on Theme of Environment was organized in the park on this Sunday 14th of April, 2013, involving nearly 55 kids and Childern of the societies. Prizes and attractive were distributed among the participants as a souvenirs. Earlier On the eve of this Programme 15 childern cleaned the whole park sporting the caps having slogan of Green Guards. The green Guards has chosen Mr. Js dahia as the founder President and madam Mohini graced its Vice President . We all are joining Mini Marathon…. You are also invited.